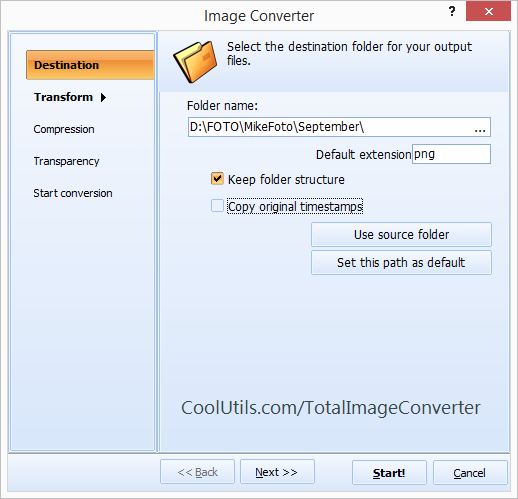 Total Image Converter is worth a handful of other image converters, which you have probably used so far, both in terms of functionality and in terms of usability. 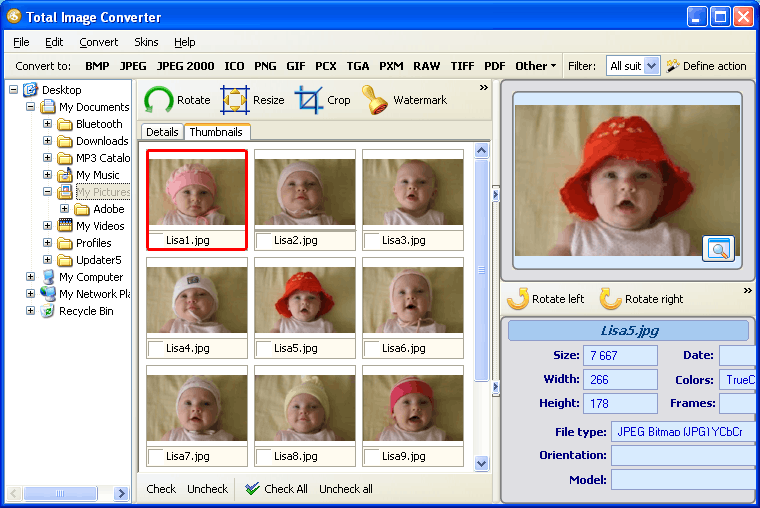 This image converter is very simple, but not primitive. It features a variety of advanced options, which include batch option, command line support, wizard, built-in image viewer, resize, rotate and crop options, watermark option, etc. All these options are very easy to navigate, and they allow users to edit their target images according to their individual preferences. 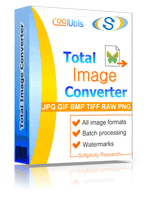 This converter allows you to export GIF to TGA in less than no time. 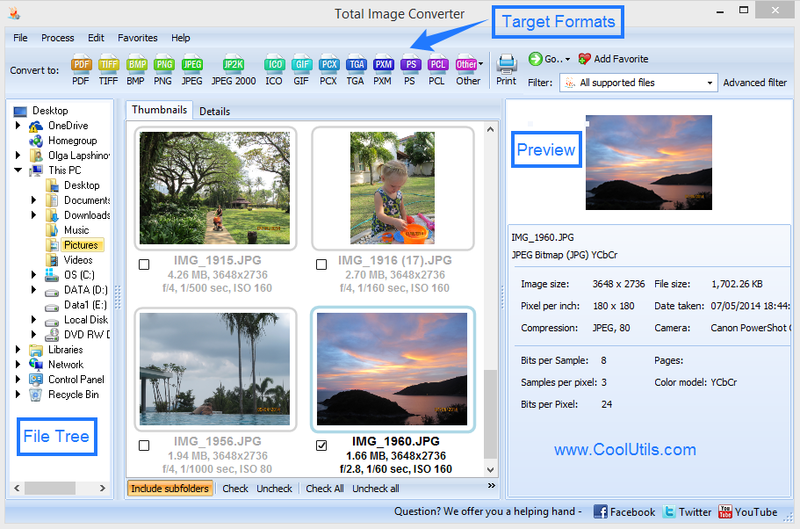 Launch Total Image Converter. Find the folder with GIF files in the folder tree and click on it. The image files will be shown in the front panel. Here you can specify files that you want to convert to TGA. If you are converting one or a few files, tick them manually. Or, if you are batch-converting, you can press 'Check All' button and check-mark the entire group. Use the built-in viewer to preview your images. Also, you can use crop, resize, rotate and watermark options located right above the list. You can edit your images in your most preferred way. Select TGA in the format toolbar or navigate Convert menu. Use the wizard and adjust conversion settings. Here you can find the options mentioned above. Select appropriate destination folder, so that you can find your files any time. Navigate the wizard and check all the functions. Press 'Start' in the end. As you can see, conversion process is very simple. It does not require expert knowledge or lifelong experience. This GIF Converter is great for both experienced users and novice users. It takes minutes for the program to convert a large amount of files to TGA. If you have not purchased the converter yet, you can check its effectiveness using the free trial version, which is valid for 30 days. If you register, you can enjoy all sorts of tech support and update your version regularly.